Description: This report allows you to report on various answers in the biannual documentations for clients. You may report on all biannual documentation collated together (6, 12, 18, etc. month), or on certain periods (ex. 6 month). 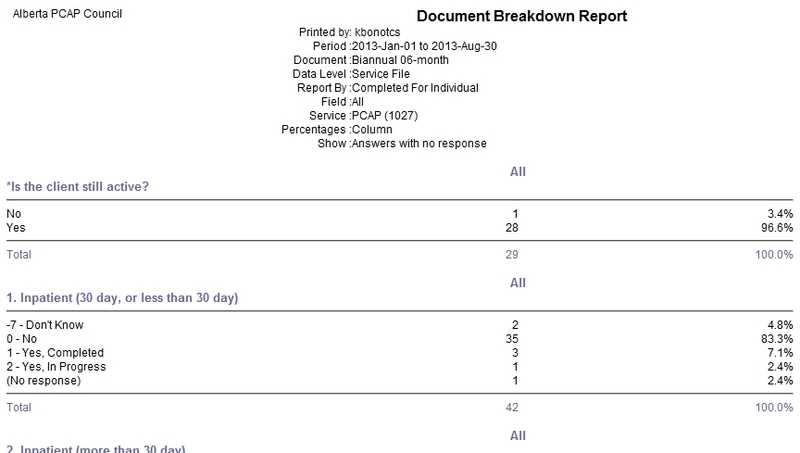 Look for the grey heading “Document Reports”, and then click the link for “Document Breakdown Report”. A box should appear with the title “Parameters”. Under “Period”, select a pre-set reporting period from the drop-down menu OR select your own start and end date in the two date fields. Under “Data Level”, select “Service File”. Under “Report By”, select “Completed For Individual”. Leave “Breakdown” blank, unless you would like to see the breakdown of answers according to certain demographics (note, there may be some missing responses as the demographics section was once optional for staff). Under “Individual Site”, select your site number. Include Question Types: By default, only “Lists (Single Select)” is selected. Select and deselect options according to the kinds of questions you would like to report on. If you would like a comprehensive report (nearly the entire biannual except for “comments”), select the following: “Lists (Single Select)”, “Lists (Multi. Select)”, “Number”, “Yes/No”, “Date (days from doc. date)”. Percentages: If you want to see percentages, select “Column” for most cases. (If you select a demographic in the “Breakdown” category, you can try different “Percentage” options depending on what you are looking for”. For “Show”, select “Answers with no response” to include reports that have no responses for the selected question. This entry was posted in Reports and tagged biannual, report on August 30, 2013 by kbonot.